I have quite a story now okay. 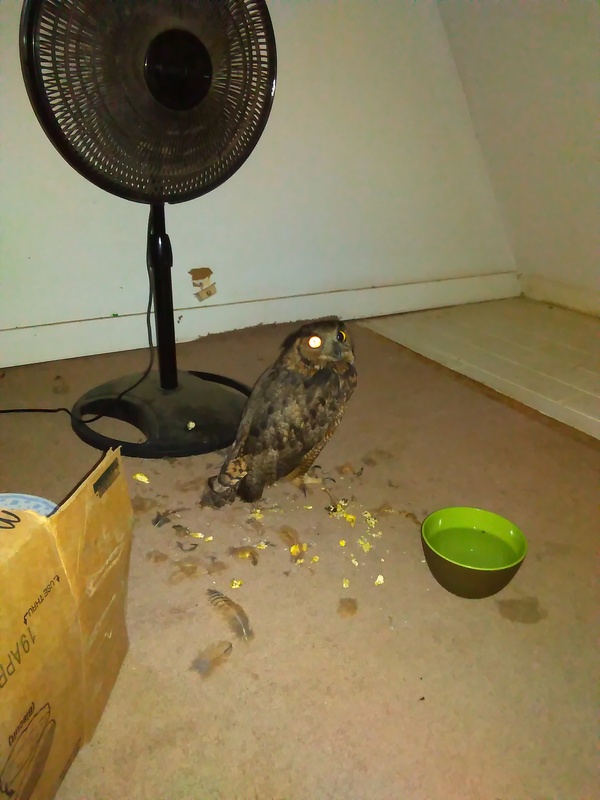 On the 19th, my mom was going home from the store and she found an injured Great Horned Owl on the road. He was clearly hurt, so she took him home and called a vet. We got to see the big guy that week (I deleted those pics because I got a better one) and that literally was the first time I saw a real owl. I don't know if that's gonna work because I got an email saying that Photobucket disabled my ability to upload pics from there on other sites so this is the only other thing I know of. BUT he was pulling feathers out (as you can see on the floor; don't know what that yellow stuff is) and didn't even move anything but his head (he did a 360 degree head turn too). After she took him to the vet, she called us and said his wing was broken and he was hit by a car, and also it was illegal to have one because they're endangered (which we already knew because my mom and step dad were asking around for someone that could take him). But even better, he didn't charge her anything because of the bird's species, which I didn't know they did that. Me being me, knowing that some falconers deal with owls, I looked for our state's falconry center, and I found the Arkansas Hawking Association. I emailed the president of the association, told him what was going on, and they immediately called her not even a day later and said they were gonna take care of it. I didn't really think "hey man you just did a great thing for a bird" because I was actually thinking "well he's probably not gonna be able to go out in the wild again." Just last night, my mom called us and said that Mr. Clemons called her back and told her that he was okay and could be released into the wild which is amazing. He's giving her three weeks to think about whether she should release him back in their area where he lived, or let him be released in an area where they created an area purely for owls. Other than that, they were both saying that I did a good thing and all I did was contact some guy who deals with hawks about an owl and bam this owl gets what he needed. But kudos to the guy for helping the owl At least I know someone in my state will help big birds. But yeah that's my experience with seeing a real, living owl and saving a bird's life. Really nice to know I did something for an endangered animal. I give more credit to my mom for taking him off the road instead of continuing to drive on like most people do here. It's wonderful your Mother stopped to pick up the injured owl, brought him home and ensured he received the necessary care from the vet. It's great you took the initiative to contact the Arkansas Hawking Association for assistance. Karma to you for your inspiration and follow-through. Some states have Wildlife Rehabilitation Experts that can also be of assistance if/when an animal is found injured. I'd let the people at the Hawking Association make the final determination on where the owl should be released. It sounds as though the area created specifically for owls would be best as that is probably safer than where the owl was living originally. Thanks! I was thinking the same for releasing it. That'd be a lot better because it could happen all over again if we released it back where they live. I just hope I get to see it when it happens. Perhaps if you ask Mr. Clemons when and where the owl will be released then you'll be able to watch when the time comes. I'll see if she can find out so we can see it. At least then I'll be able to see that they're silent fliers! So am I! I've always wanted to see birds of prey up close and personal and seeing an owl that close up was amazing! That's a wonderful story Ashley! Thanks for sharing . Best wishes to the little owl! This is really wonderful and exciting. I feel like I've seen an owl like once in my lifetime, if that, maybe a distant memory! I'm happy to hear the owl is going to be okay. Well done for your whole family. what a great story especially for the owl to fly free again.